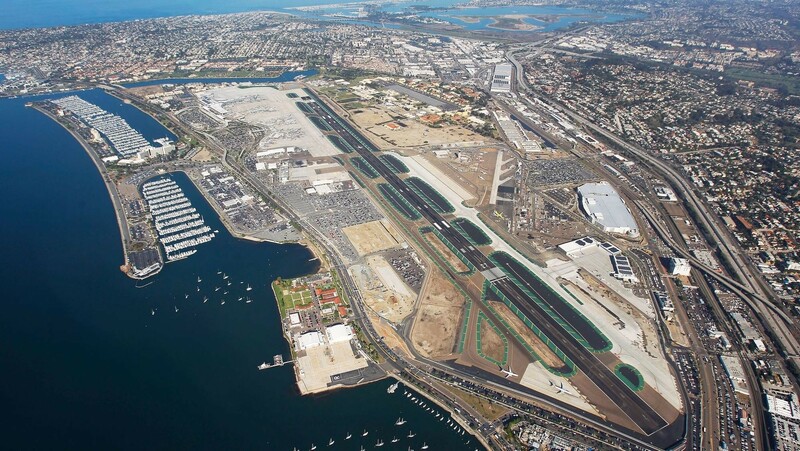 We recommend flying into the San Diego International Airport (SAN) which is approx. 2 miles from our venue, Britt Scripps Manor. 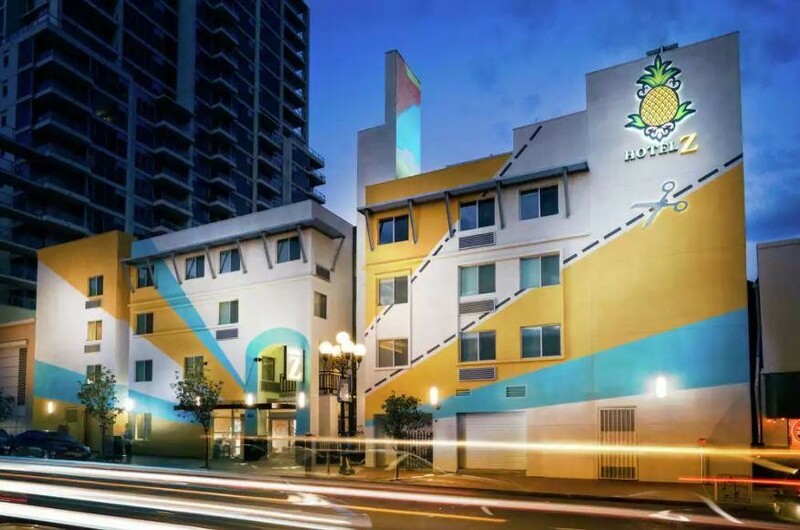 Below are just a few of the many wonderful hotels San Diego has to offer. 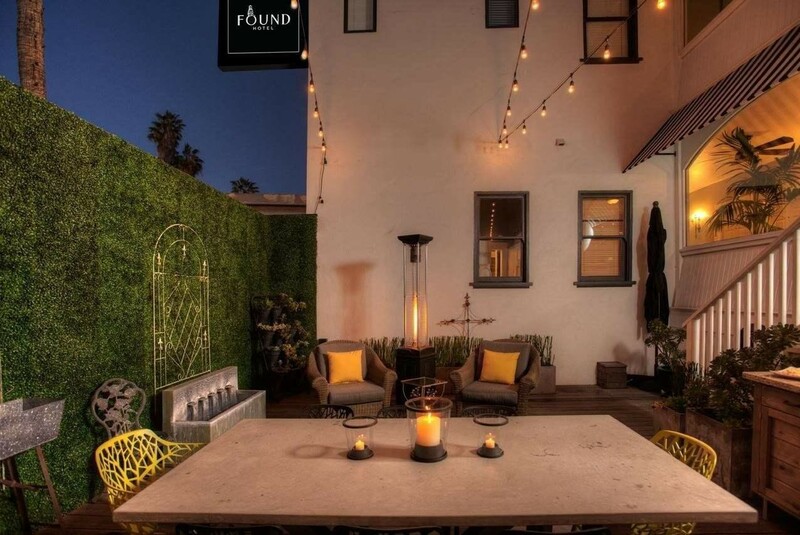 Each one is relatively close to the airport and our venue, as well as being close to downtown and several points of interest like the Gaslamp Quarter and Little Italy. You may also want to consider booking an Airbnb or VRBO rental. The Horton Grand is the location of our Sunday brunch the day after the wedding! Check out the Events tab at the top of the page for more details. 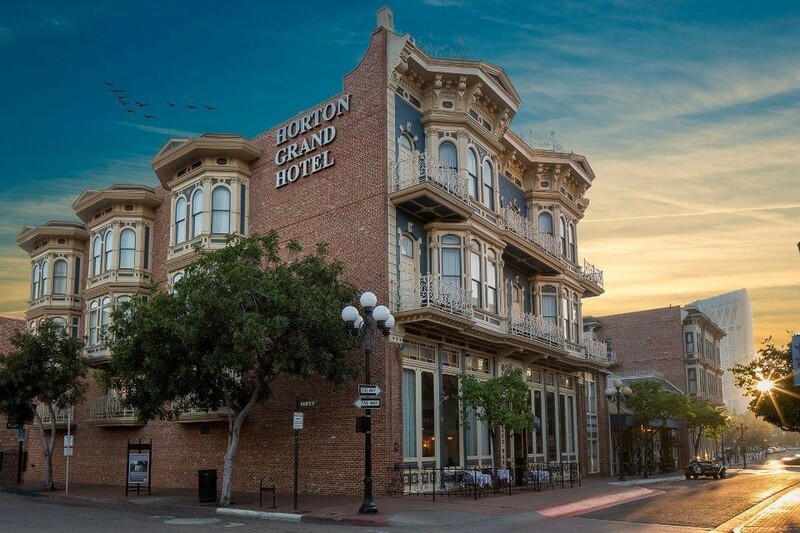 If you’re looking for the best of San Diego Gaslamp hotels, you can’t beat the Horton Grand’s unique combination of historic décor, class, and luxurious comfort. 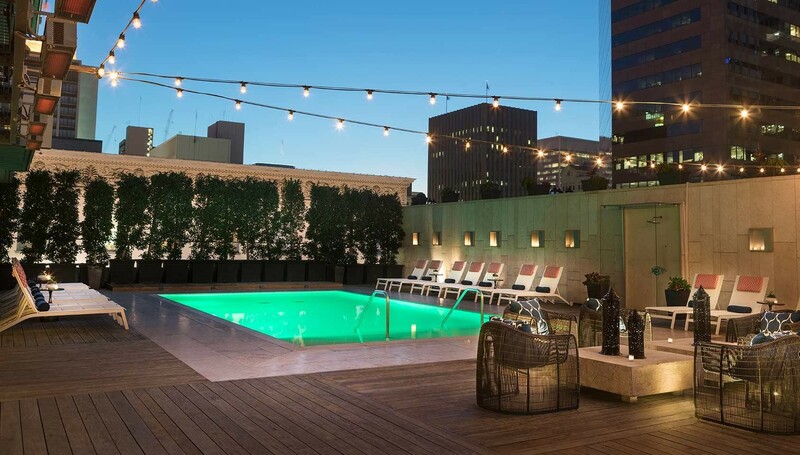 The Horton Grand Hotel is one of the most charming urban boutique hotels San Diego has to offer, located in the historic Gaslamp Quarter District; the very heart of downtown San Diego. Step inside our hotel and rediscover the timeless Victorian charm of the 1880s. Each room is adorned with handcrafted antique furniture, marble-framed gas fireplaces, and detailed architectural elegance. Enjoy complimentary wireless internet access, your own coffee/tea machine, and a flat-screen television as you relax in the distinctively historic accommodations. Inn at the Park, formerly known as Park Manor Suites is central to many attractions and sights, and is a desirable starting point for your journey in this amazing city. Our hotel is located on the edge of Balboa Park West within walking distance to the world-renowned San Diego Zoo, the Old Globe Theatre, 15 fine museums, beautiful gardens and acclaimed performing arts venues. Other nearby attractions include the vibrant Hillcrest neighborhood, SeaWorld, The Gaslamp District, Little Italy, Cruise Ship Terminal, and the USS Midway and Maritime Museum. Old Town, Coronado Island and the beaches are just minutes away from our boutique hotel in San Diego. Whether you are traveling for business, attending a convention at the San Diego Convention Center, or simply here for pleasure, you'll enjoy our spacious oversized suites featuring WiFi (Surcharge), Sealy Posturepedic beds, crisp white duvets, classic period furnishings, kitchenettes and more. We are also located near the area's major medical centers including Scripps Mercy Hospital, UCSD Medical Center, University Hospital and Continental Rehabilitation Hospital, and the Balboa Naval Hospital. 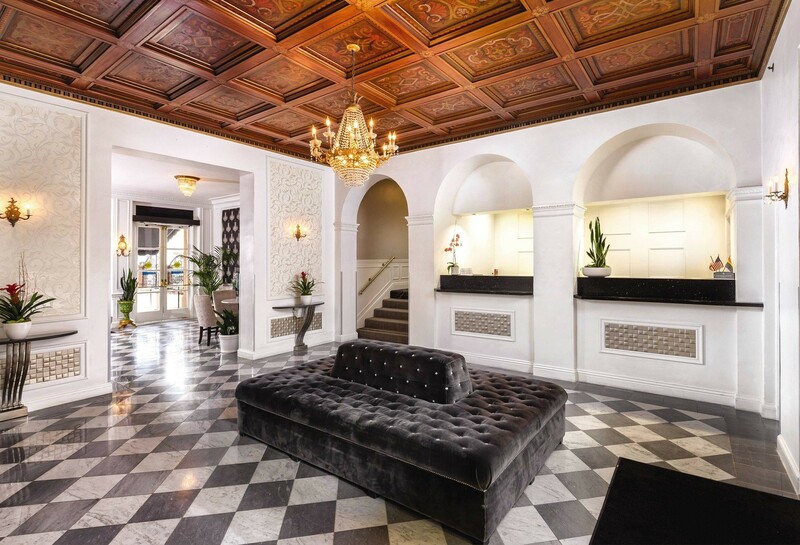 Located in a meticulously restored 1910 historical building, Found San Diego offers the grace and elegance of a historic hotel, but all the modern amenities to make your stay superbly vibrant. Our 23-room property is thoughtfully appointed with the finest furnishings, including uber comfy top-of-the-line beds, crisp linens and the fluffiest of fluffy cotton towels. 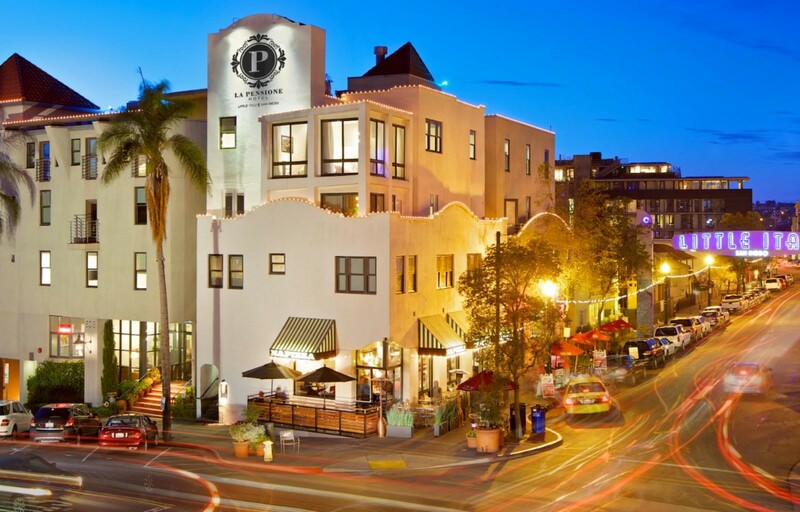 La Pensione Hotel is located in downtown San Diego’s Little Italy, with the Gaslamp Quarter and surrounding beach locales also easily accessible. Foodies are sure to love the location, as delicious pizza, pasta, and gelato can be found within mere seconds. In fact, the hotel has two on-site restaurants, Caffe Italia and Vincenzo Ristorante Italiano. 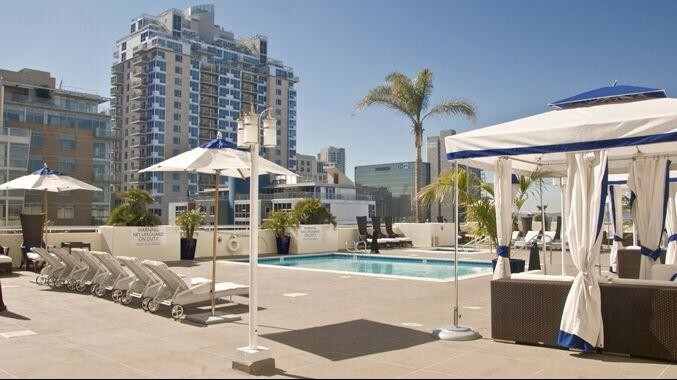 Your urban retreat: Our boutique San Diego hotel. 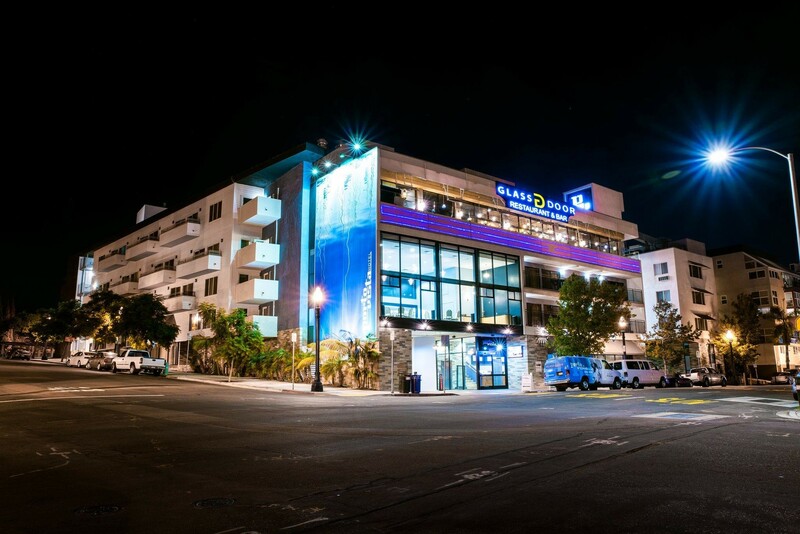 A destination as special as downtown San Diego deserves accommodations that are just as spectacular. So we brought the sleek SoCal style of our hotel’s public areas into our 211 swank guestrooms and suites to create airy, private havens that define the San Diego urban experience. What’s in the mix? Floor-to-ceiling windows, balconies with jaw-dropping vistas, plush European linens and luxe bath products. From the moment you step through the revolving front doors, you will be whisked away to an inviting and intimate space to unwind, gather your thoughts, or share a laugh and a beverage with friends. 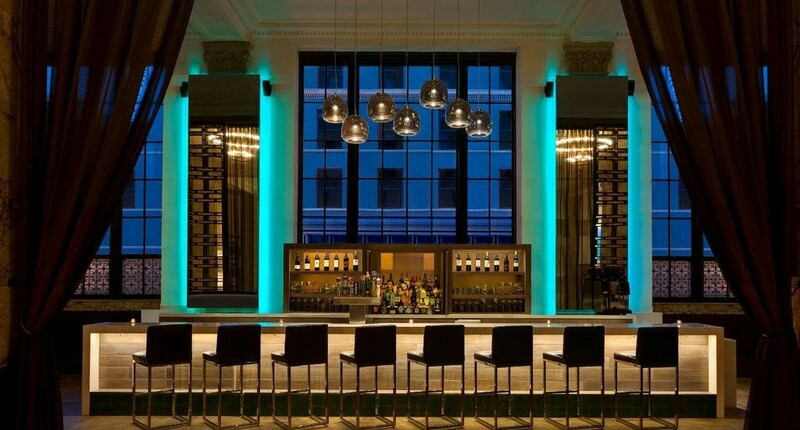 Exquisite remnants of the former bank grace the interior of our hotel and mix with a fresh, contemporary style. Be welcomed by the gorgeous vaulted ceilings of our hotel lobby and the Italian Romanesque revival architecture that blends seamlessly with modern décor to create a timeless allure.